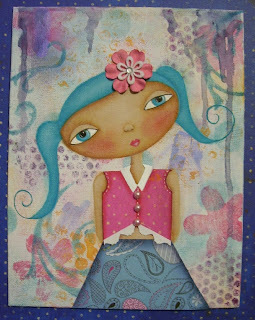 Here it is the last day of the 29 Faces of May Challenge, a wonderful hostess Martha of Ayala Art, has really pushed us to draw, sketch, paint, mixed media or whatever we fancied and whatever face we wanted to do. A commitment of 29 days I was not sure of initially but there are really no hard fast rules to post every day although I found it hard some days but I know I was not the only one doing catch up posts. I just finished this painting today on an 8x10 canvas board. Yesterday I helped serve a luncheon at my MIL's retirement home and we served 30 people. It was fun, busy and nice to spend time with my dear MIL. I was unable to commit to my face and was too tired last night but I managed to sketch the face and today I painted. So here she is saying a fond farewell and thank you very much to all of you for visiting me daily or bopping about when you had time. Her name is Gracie, she told me what colours to use and she really wanted a flower in her hair. She thought I used a bit too much blush on her cheeks, she really doesn't like to go too bold with the makeup. She is an au natural kind of girl. She told me she was going to take a trip very soon to a far away land. I said oh....really, can I come? she said she didn't think so, that I would miss Rosie too much and I really don't like the cold,so, it would be best I stay home this time. She would write me a letter and tell me of her travels. I am not sure where she is going, she said she was tired and needed to have a nap. She washed the car today so I wouldn't have to do it while she was away. Hmmm what is up with that? Now to take a bit of a blog break, tidy up some much needed things around the house, do a bit of purging and reorganizing. Thank you once again for dropping by. It's been a fun challenge. I hope to see much more of your art. Take care. such a sweet piece! how fun that Jenny inspired you to participate. i still have one more face to go! hi Lesley hasn't this been a wonderful journey... I have loved all of your wonderful faces and I hope that like me you will keep on creating them :) Although I must admit starting late I was sure I wouldn't make it to the 29 lol. I'm sorry I haven't visited often but I have been stressed as I am going for dental surgery tomorrow and it has been praying on my mind. I hope to visit lots more when I'm back to normal. Thank you for your support and all of the wonderful comments you have left me. Thank you for participating in the challenge!